Form, function and beauty combine in the Ravenna Sketch Box Easel. It unfolds for use on any steady surface and locks up snugly for travel. You'll never be hindered by a lack of space with this studio in a box. 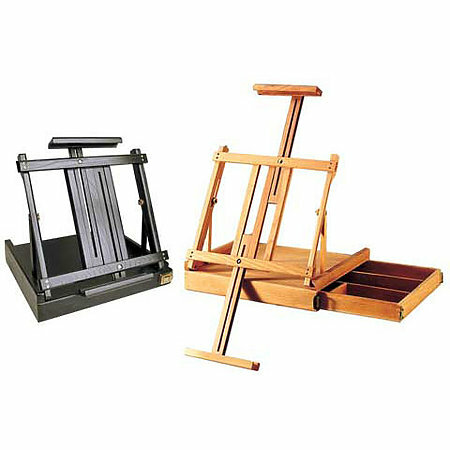 Canvas supports extend to accommodate canvases up to 34" and yet it folds to a compact, portable size of 16" x 14" x 5". Made from seasoned hardwood, it has an easily accessible side drawer with four compartments to hold all your supplies plus a carrying handle. Clasps keep materials secured for transport.